Carlton snap a 14game losing streak against the Hawks, winning a thriller by eight points. They were led superbly by Marc Murphy, who recorded a team-high 34 disposals including 23 uncontested possessions. He also recorded six clearances. The Hawks have smashed Carlton in the stoppages in this last quarter, recording a 144 advantage. 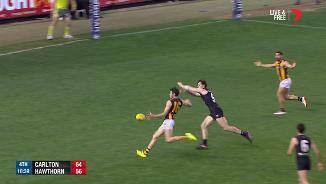 Isaac Smith has recorded five of those clearances. Despite this, Hawthorn have only scored 1.0 (6) from this source for the quarter. Jarrod Pickett kicks his second goal of the game, a careerhigh for him. He has had 14 disposals (10 contested possessions) and an equal game-high five shots at goal. While the Hawks have had seven inside 50's this quarter, they have only had one shot at goal, going against the fact since Round 10, the Hawks have scored a goal from 27 percent of their inside 50 entries, the thirdhighest percentage recorded by a side. Hawks InterchangeTaylor Duryea off due to an injury. Since 2014, Carlton has lost the inside 50 count by 14 per game against Hawthorn, the worst differential recorded by a side. Tonight that trend is continuing, with the Hawks currently having a 4134 advantage. Fast start to the last quarter for the Hawks, recording 18 disposals to this point while the Blues have not touched the ball. Tom Mitchell is having another big night for the Hawks, recording 33 disposals to three quarter time. 15 of those disposals have been contested (a gamehigh), while he has recorded a game-high eight clearances as well. The Blues edge out the Hawks in the third quarter, kicking 4.0 (24) to 3.1 (19), to take an eight point lead into the last quarter. Carlton found open space in that quarter, leading marks 2714 and uncontested possessions 75-68. Jed Lamb kicks his second goal of the quarter, from another set shot. Remarkably, the Blues have still not missed a set shot tonight, recording 9.0 (54) from this source. The Hawks in comparison have kicked 4.2 (26) from set shots tonight. Jarrod Pickett kicks his first goal of the night from his second mark inside 50, the equal most marks inside 50 of any player on the ground. The Blues lead marks inside 50 for the match 65 and have scored 4.0 (24) from this source. The Hawks have recorded an uncontested possession rate of 66 percent this season, the highest percentage of any side in the competition. Tonight they are almost right on this average, currently at 67 percent. Hawks InterchangeRyan Schoenmakers off due to an injury. Blues InterchangeBillie Smedts and is possibly out for the game. Levi Casboult kicks a goal from a 50 metre penalty conceded by the Hawks, taking the Blues scores from set shots tonight to 7.0 (42). 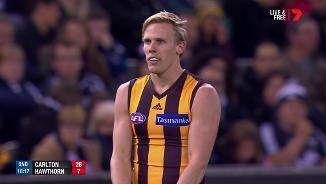 Hawthorn have conceded two goals from 50 metre penalties tonight. James Sicily gives away a free kick off the ball and Jed Lamb takes advantage, kicking the goal. Sicily has given away six free kicks tonight, taking his total for the season to 25 free kicks against. This is a big jump from the 14 he gave away in 2016. A good comeback from the Hawks in the second quarter, closing the margin to just three points. Tom Mitchell has been dominant with 22 disposals, nine more than any other player on his team. He also has a teamhigh five tackles and five clearances. 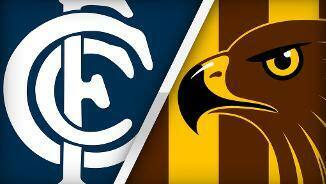 The Hawks have dominated this quarter, kicking 4.5 (29) to the Blues just 1.0 (6). This is off the back of a plus8 differential in inside 50's, including nine of the last ten in the match. Tom Mitchell misses a set shot from directly in front. Over his career, Mitchell has recorded a 50 percent accuracy rate when kicking for goal. Tonight he is the leading possession winner on the ground with 19 (eight contested). The Hawks have lifted in the contested ball, leading contested possessions 2216 in the second quarter. Hawthorn are also finding more space with the ball, leading uncontested possessions 34-21 and marks 11-7 in the second quarter. Luke Breust with his first goal of the night, and the Hawks second for the quarter. Breust averages 1.7 goals per game against Carlton, slightly down on his career average of 1.9 goals per game. Despite the Hawks having the better of the stoppages with a 1611 lead in clearances, they're struggling to turn that into scores. It's the Blues who have scored 2.1 (13) from stoppages, to the Hawks 0.1 (1). Will Langford kicks the first goal of the second quarter, from a mark and set shot inside 50. Before that goal, Langford had kicked 1.9 from set shots this year. An impressive first quarter from the Blues, who lead the disposal count 9991, the contested possession count 39-31 and inside 50's 13-10. Carlton are also efficient going forward, having had a shot at goal 77 percent of the time they've gone inside 50. Tom Mitchell is leading the way for the Hawks in the first quarter. He has 11 disposals (five contested possessions), three clearances and a kicking efficiency rate of 100 percent. In his return game, Hawks midfielder Jeagar O'Meara is yet to record a disposal. He is the only player on the ground without a disposal to this point in the game. We mentioned Marc Murphy's excellent record against the Hawks prematch and he's continuing that form tonight. In this first quarter, Murphy has a game-high eight disposals, including four contested possessions, two clearances and three inside 50's. 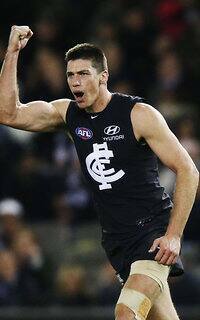 A strong start from Matthew Kreuzer. The Blues ruckman has four disposals, two clearances, one inside 50 and 107 metres gained. He is the only player on the ground to have over 100 metres gained for either side. The Blues have made a bright start. They lead inside 50's 61 and contested possessions 10-4 at this early stage, with over 80 percent of the match being played in Carlton's forward half. Bryce Gibbs kicks the first goal of the game after having a goal overturned on review just minutes earlier. His goal tonight means he has scored at least one goal in his last four games against the Hawks. Since 2014, Marc Murphy has averaged a teamhigh 33 disposals per game against Hawthorn. For the Hawks, Tom Mitchell has averaged a career-low 21.6 disposals across his career against the Blues. Since 2015, the Blues have scored from 26 percent of their intercepts against the Hawks, the lowest percentage of any side. Meanwhile, Hawthorn scored 89 points directly from its intercepts last week, its highest amount recorded in a match this season. Welcome to Etihad Stadium for the Carlton v Hawthorn Round 22 clash. CARLTON has ended a 14-game losing run against Hawthorn and closed the door on the Hawks' season with a gutsy seven-point win at Etihad Stadium on Saturday night. The Blues produced some of the best and most disciplined football of their season to win their first game since round 13, boosting their chances of avoiding the wooden spoon with the 12.5 (77) to 10.10 (70) win. Hawthorn's slim finals hopes were extinguished in the process, with a late surge in the final quarter falling short as the Blues beat their tormentors for the first time since 2005. The win also came on the night the Blues celebrated the 30th anniversary of their 1987 VFL premiership, with the Robert Walls coached team doing a lap of honour before the start of the match. 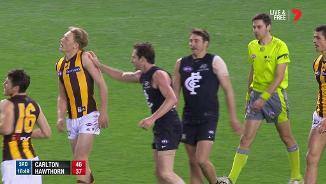 It was a spiteful clash from the start, with Jed Lamb and James Sicily involved in a number of skirmishes through the night as the Blues sought to shut down the young Hawks defender. The tactic worked, with Lamb among Carlton's best players with 15 possessions and 2.2, while Sicily gave away seven free kicks and took just two marks in his defensive role. Blues captain Marc Murphy was excellent in the midfield with 34 possessions, six clearances and four inside 50s, while Sam Docherty was the architect in defence with 31 and 15 marks. The most pleasing aspect of the win for the Blues, however, would have been the impact of some of the young players who appeared to have been tiring as the season dragged to a close. Charlie Curnow showed great signs across half-forward, flying to take contested marks and finishing with 22 possessions (14 contested). Jarrod Pickett was a livewire in attack with two goals, while Zac Fisher got the team going in the first quarter. Ruckman Matthew Kreuzer had the slight edge on Hawthorn opponent Ben McEvoy even battle between the workhorses, finishing with 29 hit-outs, five clearances and a goal. Carlton coach Brendon Bolton said the victory was a well-deserved reward for his team after its string of close losses this season. "I think what today does it just gives the ‘87 premiership team that were here, our members, our club, our players just a little bit of emotional nourishment that they deserve for their efforts over the course of the year," the coach said. "I thought they closed the game out really well. 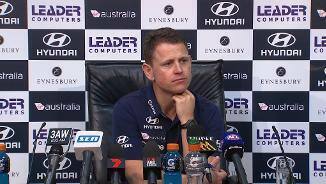 Hawthorn were pressing heavily and we turned that ball over across half-back and held on to the ball, that's good maturity for a young group." The biggest positive for the Hawks was Jaeger O'Meara's drama-free return to the game after another season wiped out by injury, with the star recruit finishing with 17 possessions and five clearances. Ball-magnet Tom Mitchell continued his record-breaking season with 44 possessions and 11 clearances, while Ryan Burton (23 possessions and a goal) gave the NAB AFL Rising Star judges more to think about. Carlton played some of the best football of its season in the opening quarter, taking a feisty attitude into the contest and ruffling the Hawks' feathers on the way to a 21-point lead at quarter-time. The circuit breaker Hawthorn needed came from an unlikely source in the opening minutes of the second quarter, with Will Langford marking 30m from goal and lining up for 17th set shot this season. It was a big moment for the 25-year-old, who had kicked just one goal from 16 set shots coming into round 22, and every teammate on the ground ran to him after he converted to start a Hawthorn fightback. O'Meara also started to work into the game around the stoppages after a quiet start, while Mitchell led the Hawks' fightback with 11 possessions as they went on a four-goals-to-one run. The Hawks had their noses in front late in the third quarter before Pickett took a nice contested grab and converted his set shot to take back the lead for Carlton. 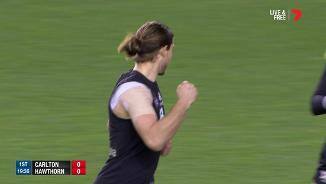 Then Lamb kicked his second goal, from 45m, and went to Sicily to ruffle his hair, leaving nobody in doubt about who had won that crucial match-up. That the Blues had been able to hold their own through a tight third term spoke volumes about their discipline under Bolton. The Hawks threw everything they had at Carlton in the final quarter but couldn't break Bolton's defensive machine, with the Blues' sixth win of the season arguably their most encouraging. 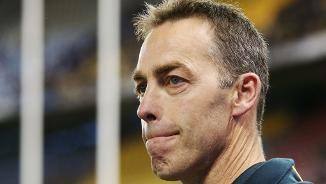 A disappointed Alastair Clarkson paid tribute to the defensively-minded Blues, who kept his team to its third lowest score of the season. 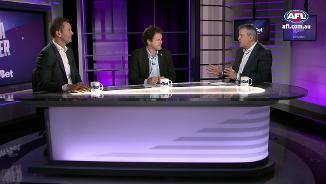 "We didn't quite get the game played on our terms, it was played on Carlton's terms all night," Clarkson said. "That's the way they like to play. When Carlton win it's always 12 goals to 10 and that's what the result was. We're disappointed with the way we played. "Full credit to Carlton. They had the game played on their terms and we were probably lucky to be close enough at quarter-time to even be in the contest." Carlton: A Blues spokesman confirmed Billie Smedts had failed a concussion test after a head clash in the third quarter and would be assessed during the week. Jack Silvagni copped a boot to the jaw that required attention but was able to play on. 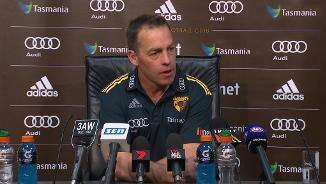 Hawthorn: Ricky Henderson had his lower back worked on during the second quarter before playing on, while Liam Shiels was a late withdrawal with a corked hip. Hawthorn champion Luke Hodge will play his final game next Friday night against the Western Bulldogs at Etihad Stadium. Carlton travels to the SCG to take on a rampaging Sydney team on Saturday.